The 6th edition of the City of Gold Urban Art Festival kicked off this week in Joburg bringing together an exciting mix of local and visiting graffiti artists to paint the streets of student neighbourhood Braamfontein. 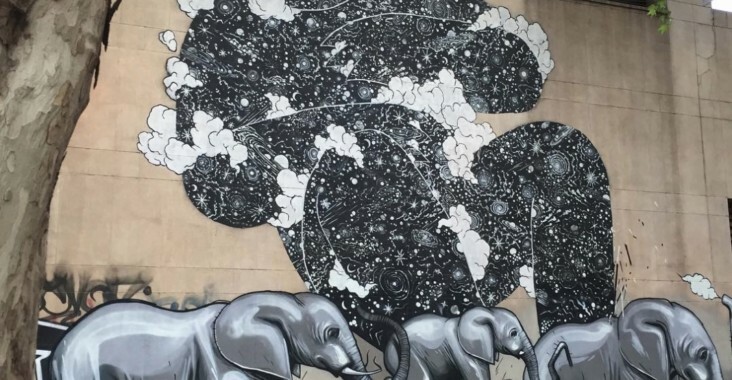 Spearheaded by the founder of Grayscale Gallery, tattoo artist and graffiti legend Rasty Knayles, the festival has established Joburg as a key destination for those who enjoy leaving their artworks in public spaces. Joburg has over the past few years been drawing graffiti artists from Cape Town, once considered South Africa’s graffiti capital until the local government there clamped down, employing everything from by-laws and miles of red tape to teams of painters to ‘clean’ off the city’s artworks. Graffiti in Joburg has luckily not been subjected to the same petty treatment and has in many ways brought life and colour to neglected neighbourhoods and turned the tables on official neglect of the city’s architecture. Rasty, enabled by a team of graffiti artists from across the city and surrounds is on a mission to establish Joburg as a destination for international graffiti artists and to also encourage a new generation of artists. He is also big believer in the power of these types of artworks to regenerate the city and believes officialdom should be doing more to promote graffiti as a positive aspect of the city. Unfortunately not all of the writing on the city’s walls is pretty. When asked about the sometimes amateur ugly scrawls that you see around Joburg Rasty patiently explains that those silly-looking scribbles – tags – are the start of a graffiti artist’s future. Bear with them because it’s part of a rite of passage to develop your own style and hopefully one day create something that others will think of as art. This year, sponsored by Montana Cans and Kwick, City of Gold Urban Art Festival also attracted Nissan as a sponsor who have handed over a Nissan Micra for painting. We gathered together some photos from the first few days of painting thanks to some of our favourite instagrammers, among them @countfrodo (who has faithfully captured much of the city’s street art and graffiti and is a fantastic resource and source of knowledge about Joburg’s graffiti scene) and @2Summers whose blog is required reading about Joburg. For more about the festival see City of Gold Urban Art Festival. Still time to join tours of the new works tomorrow through Saturday.